Native people of Mongolia find the Naadam Festival the most spectacular and joyful event in Mongolian culture life. The festival held on July 11-13, has its roots in the nomad wedding assemblies and hunting extravaganzas of the Mongol Army. 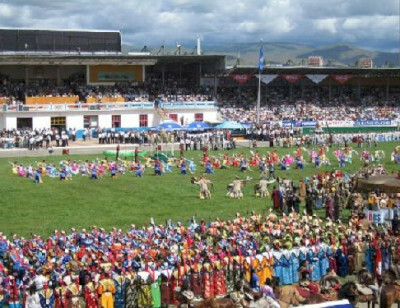 Also known as ”Eryn gurvan naadam”, this festival has been celebrated nationwide since 1921, impressing people with games of wrestling, horse racing, and making up of archery, which are considered as core activities of the National Festival. The Opening Ceremony is the most fascinating part of the festival - hundreds of artists in traditional Mongolian costumes of different eras perform dances and songs for the Opening Ceremony while are parading with hundreds of musicians and Tsam masked dancers. This is an extraordinary opportunity to spend unforgettable weekend, exploring Mongolian culture, traditions, food and music.